For half a decade we’ve delivered heart, soul, groove and rythm from here there and everywere. Oh yes, we do think that’s worth celebrating. 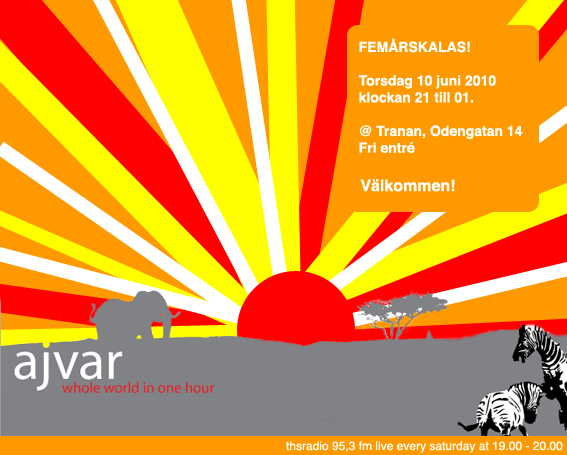 So we’re having a five year birthday bash at Tranan Bar in Stockholm on Thursday 10th of june. For this special occasion we asked or favourite guest through the years to join up and play their best tunes. We don’t expect any fancy gifts or so, but we do expect you to put on your best shoes and dance with us. We wish us Feliz Cumpleaños! Hyvää syntymäpäivää! Eku Ojobi! Dogum gunun kutlu olsun! Piranda naal vaazhthukkal! Parabens pelo seu aniversario! Sreken roden den! Til hamingju med afmaelisdaginn! Otanjou-bi Omedetou Gozaimasu! Sretan Rodendan! Wszystkiego Najlepszego! This entry was posted in Uncategorized and tagged birthday bash, five years aneversary, party, Tranan Bar on June 7, 2010 by Helena.